Michael Cera – from Juno (2007) fame – leads the cast in this fabulously fun and sweet movie about rock bands, video games, teenage angst, and good versus evil. Not to be taken at all seriously, Scott Pilgrim vs. the World is a mix of comedy, romance and daft fantasy action scenes. It is a joyous experience which will have you smiling from beginning to end. Film director Edgar Wright now has two cult classics to his name: this one and Shaun of the Dead (2004). You can find more information on this Canadian-British movie on Wikipedia and IMDb. Can’t wait see what Edgar Wright does with Ant Man next year! 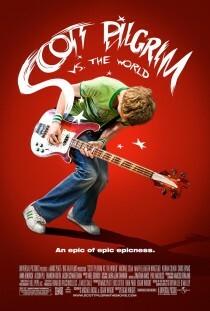 Scott Pilgrim rules! Yes, I’m looking forward to that one too, Stevie! I was unsure about this film until about 3/4 of the way through and then suddenly it all kind of clicked into place. So much fun! Hi again, Abbi. It’s SO much fun, isn’t it! This one has long been on my list of favorites. Nerdy, quirky, funny and fun–it doesn’t get better than this. And brilliant music to boot, April! love the movie, very funny!!! I’m glad you agree, Mark!! Maybe it was the initial shock to all the bizarre fantasy weirdness, Gavin? Give it another go – now that you know what to expect, you may just fall in love with it! Thanks for the recommendation, always on the lookout for 12 and PG films for the kids that aren’t animated with the exception of Studio Ghibli films and we’ve seen all those many times over. My favourite film at the moment, by the way, is ‘Restless’. Wow, Restless (2001) sounds very interesting. I’ll try and get myself a copy. Many thanks for the tip, Alicia. I actually really liked this film.. It was different and unexpected. Had no Idea what would happen next and the music was pretty darn good. I see we’re both photographers, Marcus! I like your site very much. Thank you :-). We appreciate the compliment. I am glad I came across your site because I absolutely love movies. For the last decade, movies have been a big part of my life. I don’t really enjoy television programming these days so I end up watching about 3-5 movies a week. Looking forward to reading more of your post’s. That’s great to hear. That’s what we’re here for! Hi Bronwyn. Many thanks for stopping by and leaving a comment. It’s much appreciated! A movie that will never get old. Underrated. Overlooked. Legendary. I didn’t enjoy this when i first watched it, but i think i’m in the minority. It’s been a few years so maybe i ought to rekindle my Pilgrim viewing status and see if i just completely missed the boat. Nice, snappy review! Thanks, Adam. Yes, give it another try. Maybe it still won’t be your cup of tea but it’s definitely worth another go. Ah, just reminds me that I still haven’t seen this… it sounds like a fun experience though, everyone in my family loved it. Thanks for the tip! You are most welcome, Matthew. LOL–loved the trailer–it’s on my list to watch now too. I’ve seen it three times now and have yet to ever get bored, or not find anything new or cool about it. Shame it didn’t do well at the box-office, but I guess that’s what makes it such a novelty to begin with. Good review. So, in the end, they did make a profit from the cult following. Probably quite a few million. What’s really funny – unrelated to these figures – is that last night I went for dinner with an old friend and he told me that he went to school and lived opposite director Edgar Wright. It’s a small world! I feel like this movie has taken on Goldeneye status, because I hear people talk about the video game more than the movie. Which is kind of sad, considering it’s not available to download anymore. Really? That’s interesting. I didn’t even know there was a video game -although it makes complete sense now, thinking about the graphics in the movie. It’s a brilliant film, isn’t it! I must watch it again soon. I just saw Mary Elizabeth Winstead in “Faults” (2014) – and I loved it!